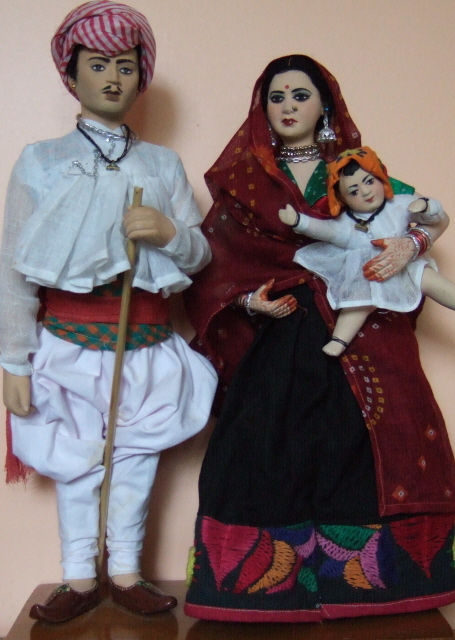 Here is a set of costume dolls that represent a cross-section of the people of India, with their diverse but distinct characteristics-painstakingly pieced together in accurate, aesthetic, authentic detail-in dress and in their jewellery, each doll a miniature piece of its human counterpart, which spells out the unity in diversity that marks India as unique among the comity of nations. 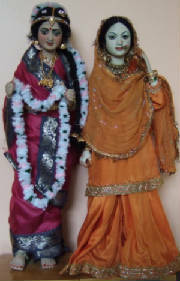 I obtained these dolls from the Shankar's International Dolls Museum. Made of clay and papier-mache, Height approx. 15"
The men of Gujarat are distiguished by their many folded turban of flame red colour, fancy shoes with upturned toes, gold ear-rings and finely cut kediyas (shirts), all lending a distinguished elegance to their apearance. The women wear ghagras (shirts) of a reddish brown or black with the most sophisticated stitches, they work long hours embroidering birds, flowers, figures and patterns that are either square or circular and with buttonhole sitiches fix mirrored glass on to their skirts, which dazzle as they move in the sun. Jammu & Kashmir is the northernmost State of India and is popularly called the Switzerland of Asia. It is one place in India where the Hindus and Muslims dress alike. Both men and women of Kashmir wear the SALWAR-a pair of baggy trousers. The upper garment is a long gown called the PHIRAN. The Kashmiri bride wears a PHIRAN richly embroidered in gold and silver or both. The head dress consists of a veil thrown over the head. The large bunches of ear-rings, called KUNDALS, covers the ears. Tamilnadu and Muslim from U.P. Manipuri is the dance form prevailing in Manipur, one of the north-eastern states of India. This traditional art once centred around Siva and Parvati. With the advent of Vaishnavism in the 18th century, it began depicting the life of Krishna and his consort, Radha. It is since known as "Ras". The graceful elements of this form, together with the devotional lyrics, make the Manipuri an expression of the inner longing for a union with God. 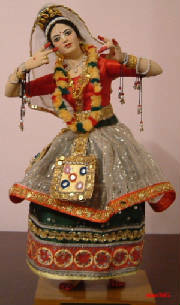 The female dancer wears an ankle-length skirt of coloured satin, heavily embroidered and ornamented with sequins and tiny mirrors. Over this is worn a transparent silver-striped skirt made of pineapple fibre that reaches the knees. The blouse is of velvet; a veil, also made of pineapple fibre, covers the face. Rows of pears on the arm, neck, and head are the only ornaments. 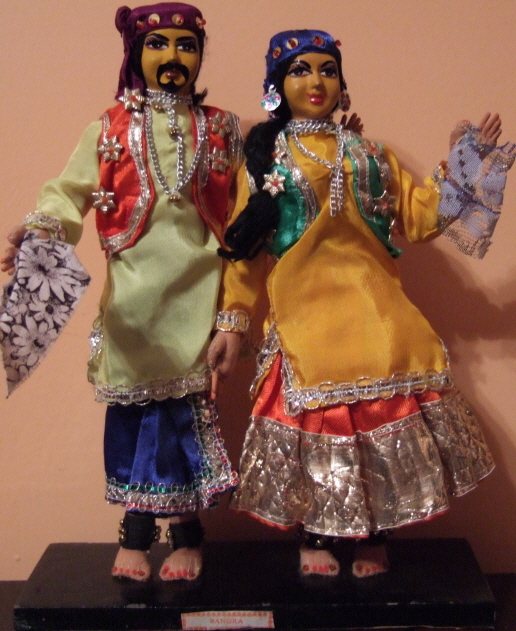 The faces of these colourful Bhangra Dancer dolls are moulded with well painted features, the bodies are made of brown cloth and are in a dancing pose, on a black wooden stand. 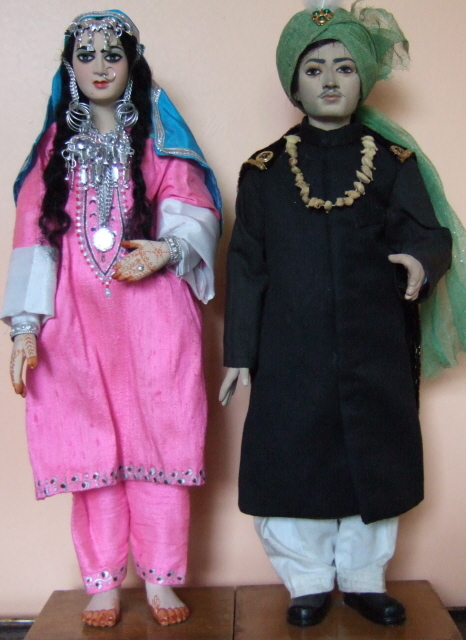 They were made in India by Aspra Dolls. Height 10 "
Bhangra is a vigorous dance with its roots in Punjab in northwest India and Pakistan. The dance is performed to celebrate BAISAKHI (the Harvest Festival). The dance movements are said to depict the cycle of Ploughing, Sowing and Reaping.